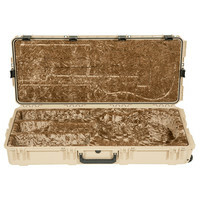 The SKB iSeries 4217-30-T Waterproof Classical/Thinline Case is designed to accommodate most classical acoustic guitars and comes in a unique Tan colour. Featuring a molded EPS interior with SKBs signature plush lining this case ensures your instrument is kept secure during transportation. The exterior of the case is constructed from ultra high-strength polypropylene copolymer resin with an integrated rubber gasket making it water and dust proof. The molded-in hinges patented trigger release latch system with TSA locks snap-down rubber over-molded cushion grip handles and automatic ambient pressure equalization valve (MIL-STD-6448C) all contribute to the military grade design and protection this case offers.